The holidays can be absolutely crazy, whether you are self-employed or working for a company, but the latter can at the very least offer you some paid down-time to recoup. Self-Employed Professionals have to hustle to make sure their income is constant by taking care of existing clients and actively seeking out new business. But, with everyone around you relaxing in nostalgic bliss, and guilting you into doing the same, how do you handle of holidays? 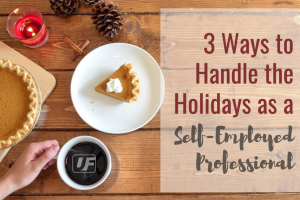 This may seem like common sense, but many self-employed professionals will find themselves wrapped up in festivities, or juggling all the holiday rush work, and forget to stop, sit down and plan it out. Creating the “Plan of Attack” for the holidays is just one thing that should be determined ahead of time. It is equally important to start mapping out your vision for the new year, major goals, and how to accomplish them. One of the biggest reasons that self-employed professionals become so stressed out and anxious during the holiday season is worrying about the work that needs to get done. Which clients will you need to contact, come January 2nd? What leads should you be following up on? What does your budget look like? Will you need a Small Business Loan or a Start-Up Loan ? Setting aside time to create a strategy ahead of time will not only decrease your amount of stress, but allow you to enjoy the holiday season. Everyone, family especially, will be tugging at your sleeves, trying to get you to take some additional time off, come to all sorts of holiday parties, celebrate out late, or just come early and prep. Be realistic about your time and how to budget it. Don’t be afraid to say, “No”, when you have business to take care of. The holidays can be a lovely time to pause and spend moments by the fire or at the table, surrounded by those you love, but as a self-employed professional you must know when attention needs to be paid to business matters first. Let your friends and family know that you are also essentially “on call” when it comes to urgent business matters. Sometimes it’s necessary to keep an eye on incoming calls or emails, in case a fire needs to be put out. Explaining this upfront to your friends and family will cut back on the side-eyes and comments when you have to take a business call. While many companies are allowing the first couple of weeks for their staff to recoup and spend time relaxing, self-employed professionals do not have that luxury. The new year begins January 2nd, with scheduling follow-up calls for existing and potential clients, executing new strategies, aligning your financials and so on. While the temptation to stretch out your holiday vacation is real, so are your responsibilities as a business owner. However, despite all the extra work, the upside to being a self-employed professional and the advantages are many – but of course, you already knew that when you chose this path, didn’t you? Best of luck over this holiday season, and may you find a balance that will allow you to enjoy precious moments with friends and family, while hustlin’ like a pro.